Sometimes a bad thing can lead to many great things. That’s what happened for the McDevitt family. A few years back, John McDevitt, now 12, had to deal with a bully. It was then decided that he would pick up Brazilian jiu-jitsu. “I wasn’t really sure what to expect, he was being bullied in school, so we decided to give it a try,” said his father, also named John. “Everybody went with him, and they all liked it. His son enjoyed it. But he also went with his four sisters. Now the five of them are one big happy family, but one big happy family who can choke you out, take you down and pretty much beat the heck out of you. 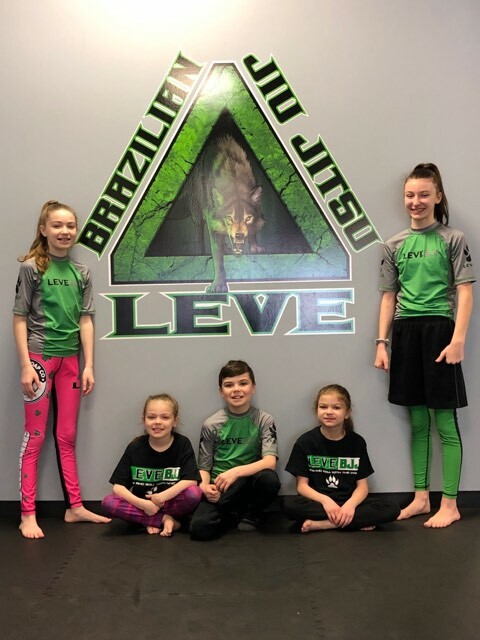 John, along with Hailey, 15, Kiera, 13, Cassidy, 9, and Kendall, 8, all take part in the sport at Leve Brazilian Jiu-Jitsu on Red Lion Road in Morrell Park. Kiera attends MaST Charter. The rest go to Tacony Academy Charter. And while the family has been busy having fun and training, they’ve also been quite successful. The kids think it’s great, too. Prior to signing up for the sport, all five were good athletes, but they didn’t enjoy the best confidence. Now, that’s not a problem. When asked who was the best in the family in the sport, all insist they are. During the last tournament they all competed in last month, all five took home gold medals. “My favorite part is making friends and winning tournaments,” said Hailey, a freshman at MaST Charter High School. “When I first started doing it, I would get really nervous. Nervous of my opponent and nervous about doing it, but I’m not as nervous as I was. While they’ve been doing it for only about two years, they’ve had a lot of success on the mat. In the last tournament, the Good Fight Tournament of Brotherly Love, Hailey went 4-0 and won all her bouts with a triangle choke. John took home gold by submitting all of his opponents. Kiera finished three bouts with a choke. And Cassidy and Kendall didn’t take part in tournaments, but did have bouts and both emerged victorious with submissions. It was a banner day, but as long as they’re on the mats, they’re having fun. “I like making new friends, and I like learning more about (the sport),” said John, who played football, hockey, baseball, soccer and lacrosse. “Lacrosse was my favorite sport. I played lacrosse at Lansing. The others I played at Crispin. They’re all fun. I’m learning a lot from (jiu-jitsu). I think I’m getting more confidence. He might not talk to the bully, but he does talk a lot with his sisters. And they work well together. On the mat, all of their skill can take your breath away. But chokes is this family’s favorite way to win. The rough and tumble sport is fun, but it also comes with bumps and bruises. In fact, shortly after the family signed up, Cassidy suffered a broken clavicle. But that didn’t keep her from waiting to get right back out there. The entire family enjoys seeing wins and improvement, but not everybody in the family loves the idea of jiu-jitsu. Dad loves it and the kids like it, but mom, Lisa, isn’t a huge fan of the martial arts. But it’s definitely something the kids like. And the goal is to continue to get better and keep winning as many medals as possible. Winning is fun, but so is being at the gym and rolling around on the mats.